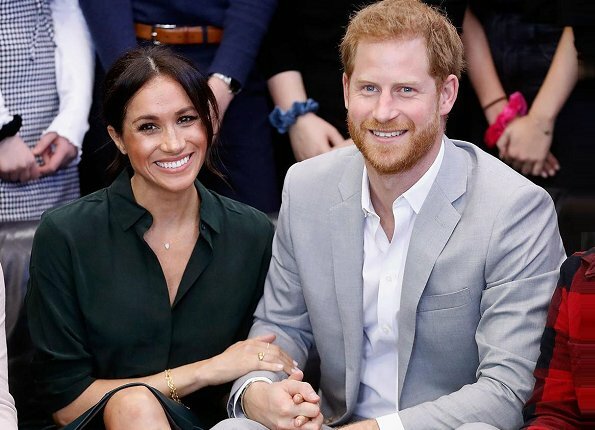 The Duke and Duchess of Sussex have announced they are expecting a baby in the Spring. A statement from Kensington Palace said: "Their Royal Highnesses have appreciated all of the support they have received from people around the world since their wedding in May and are delighted to be able to share this happy news with the public." The Duke and Duchess of Sussex are in Sydney for their first official tour. In addition to Australia, they will visit Fiji, Tonga and New Zealand. A very, very good new and I'm happy for Meghan and Harry! The Duchess has had that glow about her, hasn't she? This is just great news. Congrats to the happy couple. C'était esperé: Harry adore les enfants (il l'a toujours dit) et vu l'âge de Meghan... Félicitations! This is wonderful news. I think they make a beautiful couple and wish them the best for the future. Ha, ha, told so weeks ago because one could see it on her face... A Baby is always good news!!! Da ist es doch schön für die beiden, dass es so schnell geklappt hat. Ich freue mich für sie. Und ich freue mich für Harry, bald eine eigene Familie zu haben. Ich finde, er ist lang genug als drittes Rad am Wagen neben William und Kate hergelaufen. Er hat eine Partnerin gefunden, die super zu ihm passt und jetzt noch ein Baby. Schön! Now again the waiting game. Boy or girl?? Well lets wait and see. I wish them the best for the future. I think it's IVF twins. Anonymous, you might be right with IVF. Perhaps they did not want to wait as long as Monacos Charlene and Albert did, and that is why she is already pregnant? But I am afraid the mentioning of IVF here is a taboo. So very happy for Harry and Meghan!